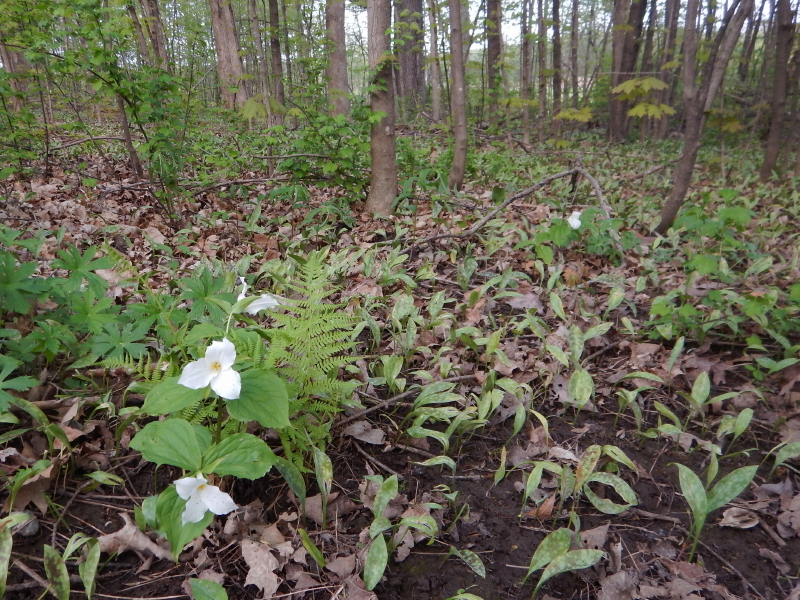 The multitude of flora on our property is springing forth at a variety of rates this year. To our surprise, some of our trillium are flowering earlier than we’ve seen before. That’s particularly thrilling for us because most of the bloomers are transplants we brought from Cyndie’s family vacation home up north. We’ve had a good run of consecutive dry days, followed by a perfect evening rainstorm Monday night and it is making growing things very happy. Getting the water right is key to a lot of things. I went for a scouting bike ride on Sunday to investigate a route that didn’t involve gravel roads. I was successful in that, but in so doing, I out-rode my water supply. The last spot I was planning to get a refill hadn’t yet opened for the season. I decided to push for the finish on limited rations. It’s not that hard. I limped home safe and sound, but I was unsurprisingly under-hydrated. What intrigues me is how long the evidence has lingered. Two days later, despite consciously increasing my usual daily intake in hopes of catching up, my primary barometer (urine color) revealed I was still behind. Working on a long game toward optimal health involves an unending series of small daily efforts. It involves making corrections along the way for intermittent deviations. As I prepared my breakfast and lunch last night for today’s shift in the mine, measuring the amount of cereal to meet my goals for grams of sugar, it hit me again how different my diet is from just a couple of years ago. I don’t expect I’ve yet reached a point of undoing what decades of a high sugar intake produced in me. It was probably in the late 1980s that I attended a lecture that touted a mantra of eating like a king for breakfast, a queen for lunch, and a pauper for dinner. I embraced that part about breakfast with gusto, figuring my high activity sports habit was more than enough justification to eat whatever I wanted. Portion sizes swelled, guilt-free. Meanwhile, my body tended to swell, too –despite the constant exercise of soccer and cycling. I miss eating too much cereal for breakfast whenever I felt like it, but I don’t miss how it made me look and feel. Pondering the difference helps to reinvigorate my inspiration for staying on course for the long haul. I’m feeling renewed energy to spring forth into another year of living well. Maybe it will bring me into full bloom sooner than I expect.